Before I started this course I was a Twitter-nonbeliever. The term ‘social media’ turned me away because I was already using Facebook and that was enough for me. Or so I thought. 140 character posts, known as tweets, can be seen by not only the users who follow you but by anyone who searches for certain key words. If you’re like me, a ‘shrinking violet’, the idea of your thoughts being broadcasted renders you speechless. For you, I have a few facts that might bring you piece of mind. In short, it’s extremely unlikely that our tweets will be seen by the masses, and they will be buried by tweet data like tiny JSON time capsules. Using tags gives you the immediate satisfaction of participating in a larger conversation where readers with similar interests will find your input useful, without the same lasting effect as writing on a Facebook wall. 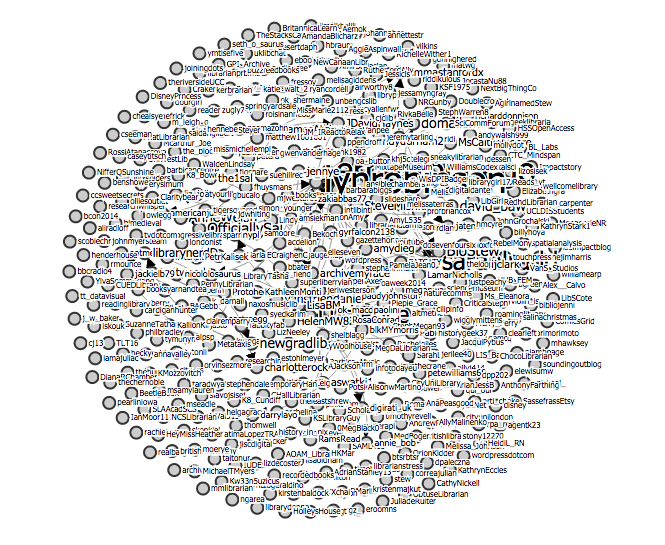 Another effect of the massive amount of tweets is the need to represent the data visually in order to include the extent of the information. Visualization as a method emphasizes the group trends not the individual. For example, in DITA this week we experimented with an application named TAGS (Twitteralytics Google Spreadsheet). It is a mashup of two APIs, one which accesses Twitter data feed , and the other a Google Sheet. The purpose of the app is to export tweets of a specified search phrase into a spreadsheet, the archive of tweets can then be manipulated in meaningful ways. I generated this image from an archive of my classmates tweets, #citylis, specifically to demonstrate how quickly muddled the results can become. Another example of what a Twitter community looks like was presented by the Boston Globe. 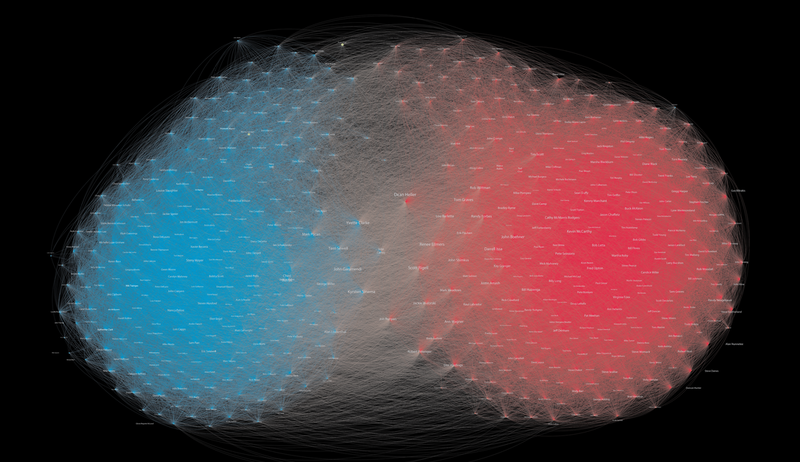 The study visualizes how Congress connects on Twitter. I think it is safe to say that I feel differently about Twitter now than when I first started. It’s not so much an opportunity to vanity as it as an opportunity to represent yourself by the issues you care about and the groups you support. Scholar Dhiraj Murthy writes about Twitter and social identity in “Twitter: Social Communication in the Twitter Age”. A very interesting read if you are into social theory. Many of Murthy’s theories are realized with visual interpretations. Like I said at the beginning of this post, there is so much more to Twitter than I though.